Aashiq Jivani created campus organization for UTSA’s first-gens. (Oct. 11, 2017) -- Meet Aashiq Jivani. This Honors College student in the UTSA College of Business is making his mark on campus by being an advocate for students who are the first in their family to earn a four-year degree. Jivani said it’s an effort he is extremely proud of because he is a first-generation Roadrunner himself. After noticing the large population of first-gen students at UTSA and understanding the unique needs they have, Jivani decided to create the Society of First Generation Scholars. The organization connects first-generation students and provides them with an open forum to learn about resources to help them complete their degrees. Jivani says he didn’t know how to study or meet new people when he got to college, so he hopes the group supports other first-generation students who face similar challenges. Jivani schedules guest speakers, who provide career advice, for the Society of First Generation Scholars. He also plans networking workshops and mixers with other student organizations on campus to give people a chance to meet. In addition to leading the Society of First Generation Scholars, Jivani is very active on campus. He serves as the vice president of finance in the UTSA Business Student Council and is the treasurer for the UTSA chapter of the American Marketing Association (AMA). He’s also excelling in the classroom. Jivani maintains a near-4.0 GPA and has received scholarships, such as the Governor’s Club Scholarship Endowment, which helps students pursuing degrees in the College of Business. Jivani says the support he has received from the Honors College has kept him on course to graduate in May 2018. “The advisors have been so helpful with scheduling my classes and they’ve worked with me so I could stay on track to finish my degree program in three years,” said Jivani. The UTSA marketing and finance major especially appreciates the smaller class sizes he experiences as an Honors College student and was particularly engaged by courses, such as Introduction to Finance and Principles of Investments, taught by UTSA business lecturer Ronald Sweet. Jivani says the courses have prepared him for the workplace. “Many of the faculty in the College of Business are world-renowned researchers and have decades of work experience to share with their students,” said Jivani. In addition to running a student group and keeping up with his classes, Jivani works two part-time jobs and is developing his skills as a marketing intern for a finance company this semester. 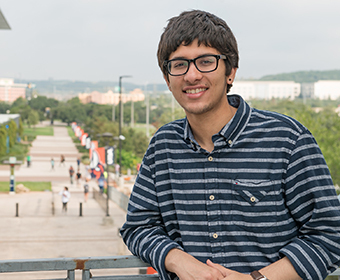 While at UTSA, the undergraduate has also developed his service leadership skills by becoming a mentor for area middle and high school students and by volunteering with community organizations like Habitat for Humanity and the San Antonio Food Bank. Looking toward graduation this spring, Jivani now has his sights on law school. Learn more about UTSA's first-generation family.